Recently I was driving while listening to a College Student Prayer Conference Call over the speaker in my car. My youngest son, Chris, leads this Tuesday night of “College Worship with a Message” and for most of the time, it turns into 45 minutes of prayer. I’ve heard Chris pray many times before, but on this night when I heard his voice, three things happened at the same moment! Tears of joy sprung forth from my eyes. God gave me inexplicable joy. The same joy in our Father experiences when we, His children cry out loud to Him in prayer. This joy felt like a drumbeat of rolling thunder through my heart, mind, and soul. The best way to learn to do anything is by doing that thing, right? Would you learn to ride a bike, play football or cook a meal by reading about how to do them? No, you would practice! 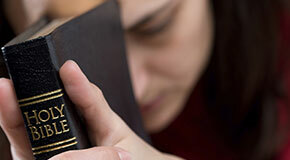 Like these activities, the best way to learn how to pray is to pray. So we can be obedient by doing it. In James 5:16 we are given the commandment to “pray for one another.” I often quote Leonard Ravenhill when teaching on prayer where he says, “Few are called to preach, but all are called to pray!” The instruction from James is addressed to every believer in Jesus. So, if you are reading this, then you are called by God to pray. “Give thanks in all circumstances; for this is God’s will for you in Christ Jesus.” (1 Thessalonians 5:18) Right before this verse, it says, “Pray without ceasing,” which is another instruction to pray. "If there was one thing I could pray now for you personally, what would it be?" This question has allowed me to share Jesus with so many people! A few months ago, I wanted to rent a small car, but there were none available. In America, there is a company called U-Haul, which rents big cars so people can move their belongings from one place to another. Since I could find no small cars, I had no choice but to rent a U-Haul. With a listening heart, God gave me a number of opportunities to say thank you to people and then ask them the "one thing" question. When we work, we work, but when we pray, God works! In the next 24 hours, God brought Sharon, a gas station manager, Jake, a young man who had been asleep on the couch in the U-Haul office, and Evangelina, my bus driver at the airport, to salvation as I thanked and prayed for each of them in response to the "one thing" prayer question. Now, salvation does not come with every person you pray for. However, the more people you pray for, the more you will see God heal, encourage, and set free from worry. 1. Igniting Prayer Action’s Online School of Prayer is a simple, eight-session, scripturally based teaching that brings you from a place of setting time apart for prayer to living with prayer as a part of who you are. 2. Zume Online Disciple Multiplication Training is a remarkable, life-transforming way to step into prayer-filled obedience of the Great Commission. I have just completed facilitating a small group of seven through this 10-session journey, and each one of us has grown significantly in our daily rhythm of a prayer-filled life. Will you commit to saying an intentional "thank you" to five people a day and then asking the "one thing" question of at least two of those people a day? Let us know if you asked the "one thing" question with those around you! Connect with a caring Christian friend today. Prayer is a conversation between you and God. Here’s why you should pray.